Bear hunting in Washington State is a unique experience involving a combination of driving, stalking, tree-stand or ground-blind hunting, usually in pre-scouted areas. 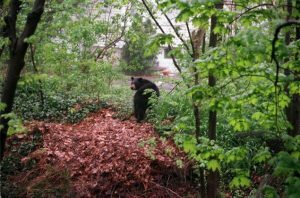 If you’re planning on going hunting, Washington State offers many black bear guided hunting packages. Even though they’re called blacks, you will find they come in a variety of colors such as pure black, cinnamon, brown, to all black with a tuft of white on their chest. If you choose to harvest a black bear, Washington State has the most bears of the southern 48 states and usually the highest harvest in the state. Should your bear hunting trip be successful, most outfitters will dress and cape your game to make sure the quality and freshness last for your trip home. Caping is an art, and if done properly will preserve the taste and freshness of the harvested game. By the way, you may be interested to know that the Washington Department of Fish and Wildlife now needs all hunters to submit a post season report by e-mail, or phone. You can still send your report in by snail mail as well. This allows the Department to assess the numbers of animals harvested and track the bear population accordingly. This in turn helps them set the hunting seasons. If hunters don’t report their activity in Washington State then they will be issuing fines for non-compliance. Speaking of submitting your post hunting season report, you can buy your hunting license on line, and also apply for a special permit. Get your application for a spring black bear special hunting permit prior to the deadlines listed on the site. Special hunt permits are drawn to spread out special opportunities over and above the general hunting season. You can only buy one special permit application per species per year. The drawings are done using a weighted points computer drawing system. That’s the fairest way to be chosen. Deadlines for black bear hunting are usually about the middle of March. In order to take part in hunting bear, everyone must have a license, regardless of age. Special hunts can be called for a variety of reasons, including hunts called to help mitigate black bear damage to trees. One such example is when timber managers called for help to control black bear damage in a local Tree Farm. Black bears strip the bark from the young trees and eat the sweet layer under it. On average, a black bear can destroy up to 70 trees. Multiply 70 trees times more than one black bear, and you have an enormous financial loss to forestry industry plantations. In cases such as this, a special permit for bear hunting in Washington State will be issued an average of at least 100 hunters.